This book is a great start to a new series. It is set in a little town called Dixie in Tennessee. Love the down home small town feel. You start out getting to know Liv who is the owner of Liv 4 Fun a party planning business. She is getting ready for Mr and Mrs Erdman's 40th wedding anniversary party where she has Mrs Erdman wanting elegant southern charm and Mr Erdman wanting men dressed as bootleggers with moonshine. Yes, you guessed it Liv has her hands full with this party. One of the must have decorations for Mrs Erdman are ice sculptures. So she bought a freezer to put them in prior to the party. They went to check on the size when they found two dead bodies, one on ice and the other in a garbage bag. This is only the start of Liv's bad luck. The police find a connection to her father in laws trucking company, McKay's trucking. This puts everyone on edge and things go down hill from there. Liv and her friend Di are on a mission to find the real killer or killers and save McKay's trucking. Will they be able to save themselves from trouble should be the real question??? These characters in Dixie are a hoot. I loved the southern charm and close knit family ties. Loved the humor along the way too. At times I was laughing out loud. The story line was well written and kept a steady pace. I really liked the fact that Liv was married. Not many cozies have a main character who is married and I loved how they interacted. The author brought out the close knit southern family, can't beat it. The characters were all great. Can't wait to get to know them better as the series progresses. This was my first introduction to Vickie Fee, and it was a good introduction! The story follows main characters Liv and Di through their adventures in the town of Dixie. I felt that the pace of this story went at just the right speed. The plot itself is well written, well developed and thought out. While Liv was a nice enough character, I especially liked reading about Di, who is spunky! There was a huge cast of supporting characters, and I enjoyed reading about the interactions between all of them, even if I did get a bit lost at times with keeping all of the supporting characters straight in my mind. I especially liked reading the interactions between Liv and her husband, Larry Joe. Yes, I said husband! This is a rare cozy indeed that the main character is married and not involved in a love triangle! Although we did see some cuteness between the couple, I can't wait to see that relationship grow in future books. I didn't peg the "whodunit" in this book, which is unusual for me, so I really enjoyed reading the last few chapters because there were a few twists to the plot. I do feel like the end was a bit rushed and wrapped, but at the same time I don't feel like I missed out on anything. Overall, Death Crashes The Party was a fun read from a new author and a good start to a new series! I look forward to seeing these characters again and see how they grow into their stories. I enjoyed this book and I have already pre-ordered the second book in this series! I received an ARC of this book, from NetGalley, in exchange for my honest review. 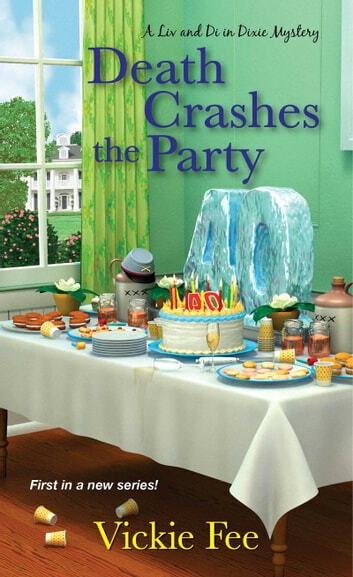 Death Crashes the Party by Vickie Fee is the first book in A Liv and Di in Dixie Mystery series. Olivia “Liv” McKay owns and runs Liv 4 Fun, a party planning business in Dixie, Tennessee. Liv is married to Larry Joe McKay who runs McKay Trucking with his father. Her best friend (and partner in crime) is Diana “Di” Souther. Di is the postal carrier for the town. Liv is busy planning an anniversary party for the Erdman’s who want conflicting themes. Liv ends up coming up with Moonshine and Magnolias (the husband wants redneck and the wife wants classy). While checking the freezer in the Erdman’s garage to see if it will hold the ice sculpture (Mrs. Erdman’s request), Liv finds a dead body. She jumps back, trips over a green trash can, knocks it over and finds another body. They turn out to be Duane and Darrell Farrell. They worked at McKay Trucking. Determined to clear McKay Trucking and the McKay name (since her husband and father-in-law are the prime suspects), Liv (with the help of Di) sets out to find the killer. Their methods are not very ethical (actually they are against the law), but they feel the results are worth it. Can Liv solve the murders and plan a party at the same time? Will Di and Liv be able to stay out of jail? I found Death Crashes the Party to be easy to read. The mystery was good (there were some twists thrown in), but it was figuring out the killer that was a cinch. I found Death Crashes the Party to be a little superficial. It was lacking depth (and details). We did not get a lot of information on the characters. I also wish the murder had not happened right at the beginning. It needed a little more lead in before the crime (it makes for a long book). There is too much foul language in the book (especially for a cozy mystery). I do not think the foul language was needed. I give Death Crashes the Party 3 out of 5 stars. An interesting start to a new series. I will read the next book in the series to see if it improves. I received a complimentary copy of Death Crashes the Party from NetGalley in exchange for an honest review.